Now that Ethan is 11 months old, I have been searching the internet for recipes for homemade baby food (using local, organic, and IPM foods of course!). I can't tell you how many times we have given him pureed peaches from Three Springs Fruit Farm, but now it's time to diversify his palette a bit! 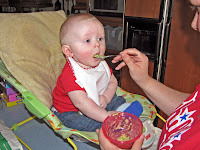 I have found a wonderful website/blog that has recipes galore, as well as how and when to introduce them to your baby. I am going to include a link to this site on the Feed, but I wanted to announce this specifically for all of you parents out there! Enjoy!! !